Due to popular demand (and it's a Corolla, after all! 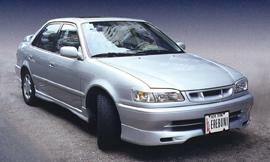 ), I will be covering mods and info for the ZZE110 Corolla here. I do not own a ZZE110 yet and have no firsthand experience with them, but that certainly won't stop me. =) I'm actually considering buying one just for the hell of it. It's just not right talking about a car that I can't put my hands on. =) Anyhow, I especially want to thank Russell for his contributions to this section. More general info and info about the 1ZZ-FE engine are under Technical Info. Here are pics of an Erebuni kit available for the ZZE110 Corolla. 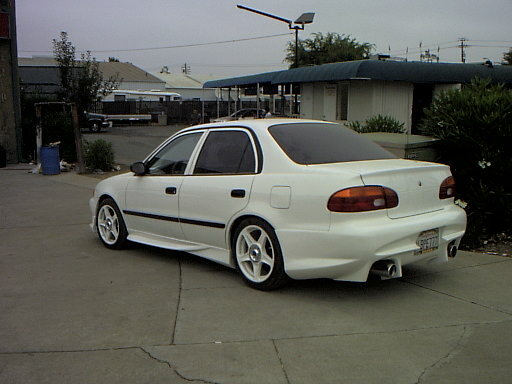 Personally, I don't like the stock look of the 98+ Corolla too much, but this kit makes it look quite nice. The following kit looks a lot better, IMO. This kit is available from DL Body Kit, based in Taiwan. Well, not all is lost. Check out the Corolla below...it was done up real nice. (I'm sorry, girl, but you gotta move! You're blocking the main attraction! =) Notice the //TRD emblems. This kit is developed by TRD and is part of their TRD Corolla package which should be widely available. See below for package details, or contact your local Toyota dealer or TRD at 800-688-5912 for more info. You can also visit TRD-USA's website (which happens to be significantly less informative than this site). As an aside, the TRD package was featured and installed in an episode of Shadetree Mechanic. 7-piece body kit by Molly Designs. Impact-resistant, polyurethane components designed to meet factory fit and finish standards. Components use factory mounting points for quick installation. 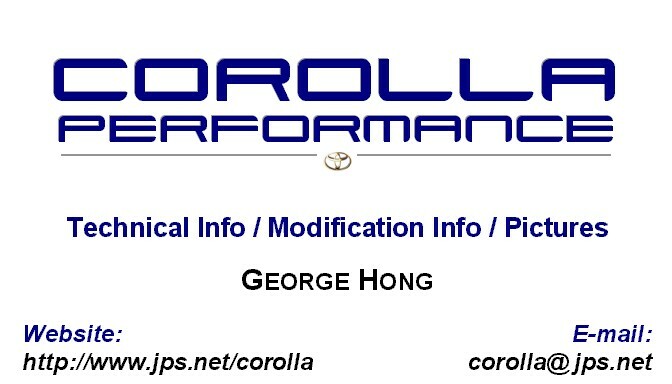 Available in all Corolla colors utilizing a 3-step, chip-resistant, clear-coated PPG paint. Includes rear spoiler. TRD emblems (3) further distinguish the vehicle. 16" x 7" TRD wheels (most likely by BBS) maintain proper offset ensuring a perfect fit. Pressure-cast aluminum alloy design reduces unsprung weight. Wrapped in 205/45/16 V-rated Nitto NT-450 EXTREME tires featuring an aggressive all-season tread pattern. Courtesy of Eibach. Progressively wound for both comfort and performance. Ride height lowered by approximately 1.25". Lower stance reduces body roll and provides tighter tracking during hard cornering. Maintain proper suspension geometry. Provide more consistent wheel control, reduced body roll, and improved cornering stability. Adapt to all types of road conditions via self-adjusting, rising-rate shock valves. Done by KYB. Note that purchasing components as a set/package will result in a lower overall price. 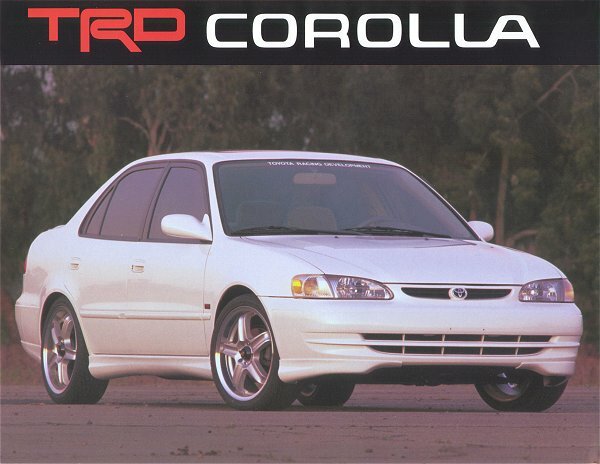 TRD Corolla body enhancement package, wheels, lowering springs, and exhaust system warranted by TRD for 3 years or 36,000 miles when installed by a Toyota dealer on new Corollas, or for remainder of original comprehensive warranty when installed by a Toyota dealer on used Corollas. Tires warranted independently by their manufacturer. Note that all components of the TRD Corolla package are classified as Level 1 TRD Sport Parts. There are talks of a supercharger being developed by TRD as well. 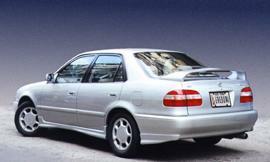 Different from the TRD package above, Toyota also offers a Touring Package for this Corolla. 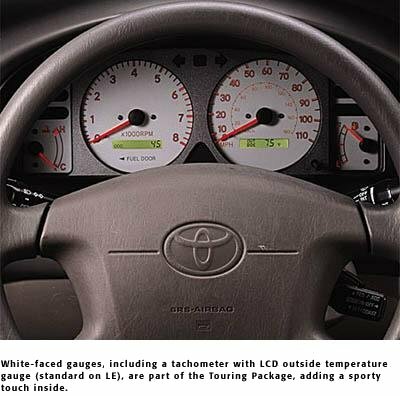 From what I hear, it entails white-faced gauges (see pic below), side skirts, and wider alloy wheels. I suppose you'll have to contact your local Toyota dealer for more details. The gauges should run somewhere around $175. Typical intakes are available too, but as usual, I recommend the custom route. Look forward to more info! 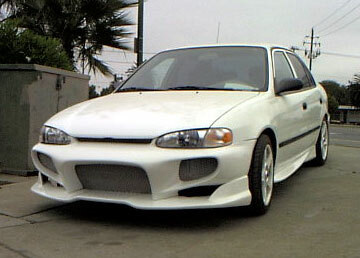 In addition to the body kits already mentioned there is a new one on the market from Andy's Auto Sport (AAC). 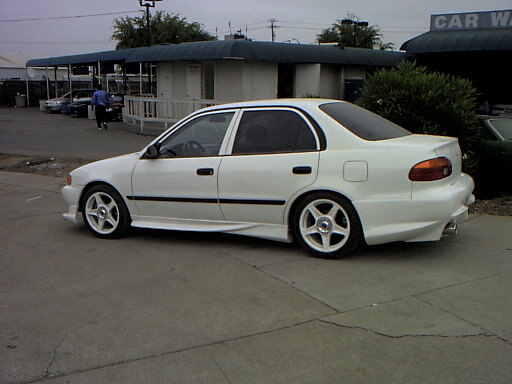 This is definately not like any other body kit on the market right now in terms of it's looks. I am not going to say whether I think it looks good or not (You can rest assured George hates it, I don't think he would support something that is not a true performance part. What a wuss! Just kidding) but I will say it leans toward the "insect-look" side. This kit is about $300 less expensive than the TRD kit but it's not pre-painted and is made out of fiberglass as opposed to the TRD kit which is made out of more durable polyurethane (nobody ever blamed TRD of cutting corners, they're just expensive). In the end it's your call, whatever floats your boat.